In this article, we'll look at the gradations that result from the maximum number of colors that can be displayed and the look-up table (LUT). While these factors are a step beyond what average users consider when choosing products, they have a significant impact on color reproduction. Users are well-advised to understand these factors, especially when choosing an LCD monitor for color-intensive applications like photo retouching or design work. 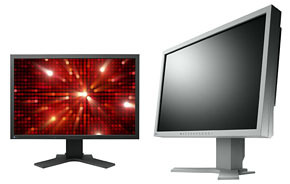 Note: Below is the translation from the Japanese of the ITmedia article "Maximum Display Colors and Look-Up Tables: Two Things to Consider When Choosing a Monitor" published February 18, 2009. Copyright 2011 ITmedia Inc. All Rights Reserved. While most LCD monitor catalogs show the maximum number of colors each model can display, few people pay much attention to this figure. That's because most products today can display a staggering number of colors—more than 16 million. Users are unlikely to be dissatisfied because the product displays too few colors. However, the figure for maximum number of colors is associated with some unexpected pitfalls. We need to keep two points in mind: First, not all leading LCD monitors can reproduce the entire full color range of approximately 16.77 million colors. Second, this full color range of 16.77 million colors can be achieved in different ways. The LCD monitors currently available generally fall into the following three categories with respect to the maximum number of colors and method of color reproduction. Only the Type 1 LCDs in the table above achieve full color in the true sense of the term, reproducing each RGB color at eight bits on an LCD panel operating at eight bits. Products that fall into Types 2 or 3 offer so-called virtual full color. Virtual full color products cost less to implement, but generally offer inferior capacity to express gradation than true eight-bit LCD panels. Certain LCD televisions and LCD monitors for commercial use are based on LCD panels that reproduce each RGB color at 10 bits. In theory, these monitors can generate 1,073,741,824 (or approximately 1.073 billion) colors; but they also require graphics accelerators and software capable of handling 10-bit color. For these reasons, they are not yet common in the PC industry. Let's consider at a simple description of frame rate control (FRC). FRC is a system for increasing the number of apparent colors by manipulating the frame rate, taking advantage of afterimage effects in the human eye. Switching rapidly between white and red, for example, will create what the human eye perceives as pink. An LCD panel with six-bit operation plus FRC can actually generate just 262,144 colors (six bits [26 = 64] to the third power [for each RGB color]). We can apply FRC to each RGB color and change the display interval between each of the LCD panel's original colors (in the case of four-bit FRC) to generate three simulated colors between each pair of individual colors. For each RGB color, this adds the following number of simulated colors: (6 bits – 1) * 3 = 189 colors. We obtain the total number of colors by calculating (6 bits + 189 = 253) to the third power (each RGB color) = 16,194,277 colors (≈ approximately 16.19 or 16.20 million colors). More and more recent products feature technologies that take FRC one step further. These technologies make it possible to reproduce approximately 16.77 million colors by operating the number of bits exceeding those with traditional FRC to generate even more stimulated colors, then taking from these the eight-bit (256-gradation) scale needed to achieve full color on an LCD monitor. Under real-life conditions, factors other than the panel, such as quality of ICs for image control, can also significantly affect picture quality. The difference in picture quality between eight bits and six bits plus FRC is often not apparent on visual inspection. Minimizing environmental lighting (for example, by dimming lights) can make such differences easier to spot. Displaying gradation patterns that change linearly, one going from shadow to highlight, can also highlight such differences. Such display tendencies apply equally to still images, moving images, games, and other applications. Sample gradation display using a full-color display operating at eight bits (left) and virtual full-color display operating at six bits plus FRC (right). While this display exaggerates the difference to make it easier to see, eight-bit operation generally offers greater gradation display capability. We've noted that six-bit operation plus FRC is inferior to eight-bit operation in terms of gradation display capability. However, this doesn't mean eight-bit operation is always superior with respect to color reproduction and gradation. The look-up table (LUT) is a key factor in an LCD monitor's ability to display tonal grades and transitions. An LUT is a table containing the results of calculations. When a system needs to process a standardized calculation, we can improve performance by having it look up an LUT value instead of performing the calculation. In the context of LCD monitors, the term LUT refers to a component that calculates input signals from the PC (at eight bits per RGB color) and maps them to output signals suited to the LCD monitor (also at eight bits per RGB color). An inexpensive LCD monitor will employ an LUT table with eight bits per RGB color; an LCD monitor designed for color reproduction applications will incorporate an LUT with more than eight bits (i.e., 10 or 12 bits) per RGB color and employ internal calculations at 10 or more bits to map input signals to output signals. Diagram of procedural flow from the input of a video signal to display on screen for an LCD monitor with LUT and internal precision exceeding eight bits. Target gamma attributes (i.e., 1.8 or 2.2) are determined in advance based on calculations assuming no difference between individual LCD panels. 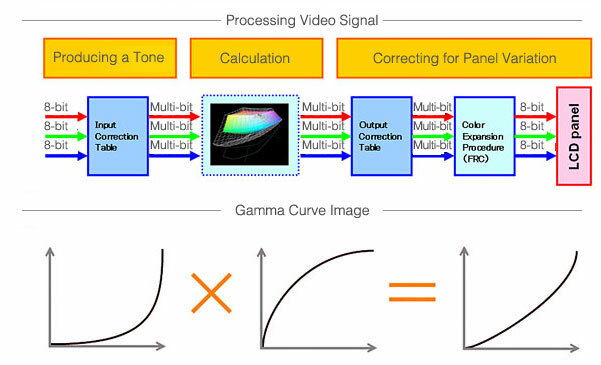 Since determining target gamma attributes alone will not result in correct color temperatures, the color space is calculated at a precision greater than eight bits, and a color gamut covering the color temperature of white is configured. Corrections on the output side offset differences between individual LCD panels and result in a smooth tone curve. An LUT of more than eight bits allows color displays with more subtle tonal variations. How does an LUT with more than eight bits improve display quality? If a catalog says an LCD monitor is capable of displaying "approximately 16.77 million (of 1,064,330,000)" colors, the unit incorporates an LUT of 10 bits per RGB color (1024 gradations to the third power = 1,064,330,000 colors). Specifically, the input signal from the PC, with eight bits per RGB color, is subjected to multi-gradation within the LCD monitor at 10 bits per RGB color, then output at the optimal display colors at eight bits per RGB color. This results in significantly smoother tonal transitions and improves hue divergence by improving the gamma curve of each RGB color in the output. A 12-bit LUT generates approximately 16.77 million optimal colors from roughly 68 billion, improving color reproduction and gradation beyond even a 10-bit LUT. Next, let's look at calculations for multi-gradation of an eight-bit per RGB color input signal at 10 or more bits per RGB color within an LCD monitor. Even if we use a 10- or 12-bit LUT, calculating multi-gradation at 14 or 16 bits will result in even more precise final tonal transitions. The need for 16-bit precision when the final output is only eight bits may not be obvious, but particularly when we seek to depict subtle differences between colors at a low-gradation gamut (shadow gamut), the precision of internal calculations is extremely important. In essence, the higher the number of bits used in the internal calculations, the closer the gamma curve in a low-gradation gamut to the theoretical curve. A look at the current range of LCD monitors shows that even in lower-cost categories, growing numbers of products offer 10-bit LUTs. Nevertheless, only products at the top of their class have bit counts greater than LUT bit counts. In particular, models that process colors to the most stringent requirements, using 12-bit LUTs and 14- or 16-bit internal calculations, are ideal for color management use, targeting applications that require high-performance color. Visual comparisons of a monitor employing an eight-bit LUT and eight-bit internal calculation with one incorporating an LUT of 10 or more bits and internal calculations of 10 or more bits shows unexpected differences. Since the latter class of products tends to feature high-performance ICs for image control, differences in picture quality are likely to be even more apparent to a discerning viewer than for entry-level products associated with inconsistent performance. When we examine the grayscale chart, models with higher bit-count LUTs and internal calculations tend to produce smoother tonal transitions and better representation of tones in shadow areas. Such products have almost no tone jumps or hue divergence and offer stable contrast in which lightness and darkness in gradation are depicted naturally. For all these reasons, we recommend a product with at least a 10-bit LUT—not just for applications that require high-fidelity color reproduction, but for ordinary PC users seeking better picture quality. A depiction of improvements in gradation following adjustments using an LUT of 10 bits or more and internal calculations of 10 bits or more . 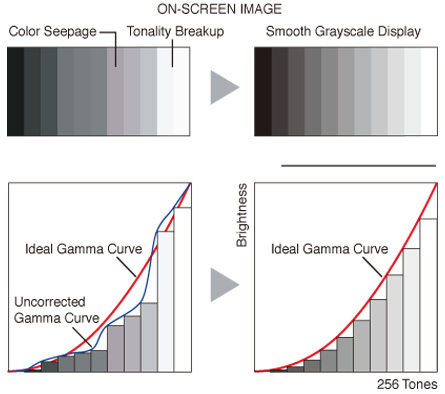 The gamma curve is closer to the ideal, with smoother gray-scale representation. Some high-end LCD monitors use a 3D-LUT, which takes the LUT concept even further. A traditional LUT system has one LUT for each RGB color and refers to the LUT for each RGB color when displaying a certain color and calculating the target color using the three RGB colors from each LUT. 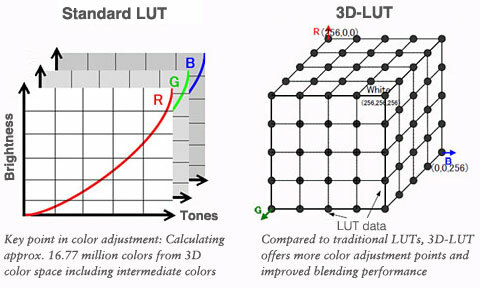 In contrast, a 3D-LUT is a three-dimensional LUT blending each RGB color (i.e., a three-dimensional table assigning R, G, and B to each of three axes). Since the LUT includes points of intermediate gradations blending R, G, and B, it offers improved color representation for intermediate gradations and improved gray-scale accuracy. 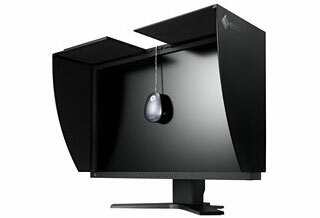 Let's use EIZO's widescreen LCD monitors as examples. Model CG242W in the ColorEdge series features a 3D-LUT. The difference between theoretical values and actual measured values in intermediate gradations is smaller than with traditional LUTs. 3D-LUTs also shine when converting color gamuts in a color-management environment. They make it possible to reallocate the approximately 16.77 million colors allocated to one color gamut to another color gamut with high precision, minimizing the loss of information from the original color gamut. In addition, since the 3D-LUT offers improved color reproduction from RGB blending, the user's manipulations and color adjustments generally have the expected results with respect to parameters such as brightness, chroma, and hue. Perhaps this is the most important aspect of performance for an LCD monitor used in color management, which above all else requires accurate color reproduction. The number of bits at which the LCD panel operates, its LUT, and the precision of the internal calculations all significantly affect the color reproduction capabilities of an LCD monitor. In not a few cases, even products with specs that look similar at first glance can diverge unexpectedly in display tendencies. Assessing monitor picture quality from catalog specs alone is unrealistic; users should inspect an actual monitor unit with their own eyes before purchasing.